Sea of Thieves, the open-ocean piracy simulator from legendary British studio Rare has finally been given a release date - the Xbox One-exclusive title will arrive in February next year. The date was confirmed by Aaron Greenberg, a marketing executive for Xbox, on the video with Kinda Funny. After only snippets of gameplay at last year's event, the blowout of gameplay shown at Microsoft's conference (as well as demos on the show floor) have proved one of E3 2016's most positively received new titles. It's not known whether this date is set in stone, with the general feeling being that Sea of Thieves is still pretty early in its development, with no news on a potential beta either. February does seem quite soon for an ambitious game of this type, but with delays almost becoming a stand operating procedure these days it would be shocking to see it slip further into 2017. 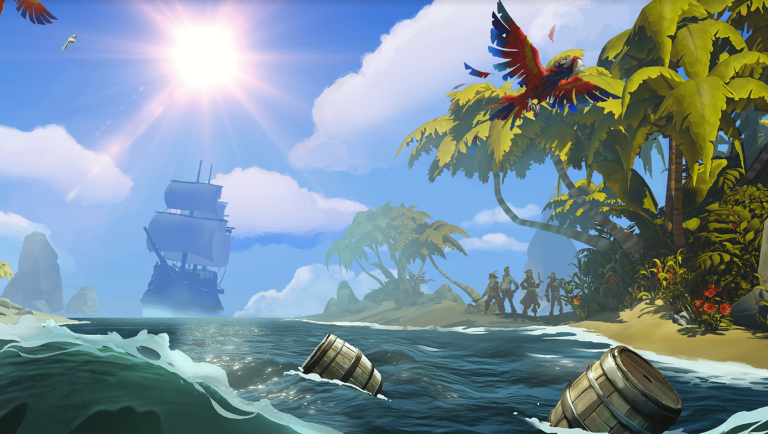 Sea of Thieves, which Rare has confirmed will not be free-to-play like the ill-fated Fable Legends from the late Lionhead Studios, won't be a traditional MMO but rather a 'shared world' where players will seamlessly come across other players working solo or sailing galleons cooperatively as crews. There's a big focus on exploration with islands to explore and enough Rare-style silly mini-games (getting wasted on grog and rum being one) so it's clearing trying to something very different in the ever expanding multiplayer genre. Sailing will form a big part of Sea of Thieves, with boats designed for crews from two to five people. You'll have to use buckets to slosh out water when you're sinking and utilise blunderbusses and other weapons to defend your ship from boarding. Considering how much fun Assassin's Creed 4: Black Flaf was in 2013, we can't wait to plunder the high seas again.